Jen Gordon has produced some great landing page designs for her iPad app development company ACleverTwist. The first example here is a click-through e-commerce template with the goal of buying an iPad app from the iTunes Store. Product hero shot: The iPad is the prime focus and the large graphic with familiar Apple reflection visual makes it very obvious what the page is about. Context of use video: To illustrate how the app works, the content within the iPad turns into a slick video which does a sped up run through of creating an iBrite picture design. Energetic music is used to catch your attention. Testimonials: A series of customer reviews from Twitter are placed below the product shot to provide some social proof regarding the app’s suitability for kids. Poll: Having a poll enables participation without making the user leave the page. It can also be a great way to gather user data. 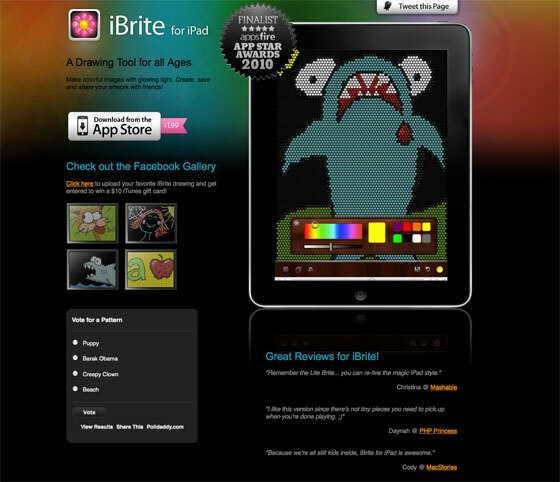 Community: There is a Facebook page associated with the application which includes a gallery of images created with the iBrite app (by the app developer and customers). This provides a forum to ask questions and interact with the creator, while adding a follow-up sales channel (there’s currently a prize draw to win a $20 iTunes gift card which is well positioned for the target demographic). Trust symbol: Right up top there is a large rosette showing off their finalist spot at an app awards review. This helps bolster the credibility factor of the app’s quality. Safety-net CTA: There are 2 examples of these secondary call’s to action: the “Tweet this page” link could get people following you on Twitter while having them spread the word, and the Facebook fan page enables repeat exposure to the app if you decide t become a fan. Fun experience The music and video together keep you very entertained and focused on what’s being shown. At no point did I try to turn the sound off (although I often do on sites in general). Due to the somewhat mysterious nature of not knowing what the final drawing will be, you hang around to the end. Great choice of upbeat classical music and the fast pace of the animated video. Attractive visuals Here, Jen has taken advantage of using the full page real-estate by using a large background image. Not only does this give you the ultimate in creative freedom, but it greatly simplifies the construction of the page. Clear CTA Despite their being several links on the page, the primary CTA “Download from the App Store” is well differentiated via color (muted silver against all the bright colors), and its placement near the top of the page. There are a few too many things to do on the page due to the links in the Twitter testimonials and the Facebook fan page. However, the benefit of the social proof (produced by linking to the real profiles) probably outweighs this. It’s also fairly unlikely that people will click through to the Twitter profiles, as they are unknown people. If someone does go searching for validation that the testimonials are genuine they would be unlikely to find them they’ll have disappeared from the Twitter streams already. The purpose of the poll isn’t 100% clear: will the answer with the most votes get created as a new example? A/B test idea: music autoplay? Some people can be thrown off by music that autoplays. Sometimes it’s a privacy thing such as being at work, the library or the time of day requiring quiet. Either way, the first reaction of many is to hit the back button when music starts. It would be good to test a version without the autoplay to see if the click-through rate to the App Store is higher. It’s important in this scenario that you have a nice big play button (preferably on the screen of the iPad). The video does stop if you click the screen (good for those who want to read the information on the page without distraction or noise) – however it’s not possible to restart the video without clicking the play button which is partially obscured at the bottom of the iPad. Another A/B test candidate would be to see the effectiveness of removing all links except for the primary CTA. Although I’m pretty sure Jen has tried a bunch of these ideas already as the page content changes frequently. One final note. It took me a long time to figure out that you get to draw with your fingers. This should be obvious as it’s a touchscreen iPad – but it might be worth explicitly describing this to enhance the fun factor – particularly for kids.